Source: Henry Sloane Coffin and Ambrose White Vernon, eds., Hymns of the Kingdom of God. New York: The A. S. Barnes Company, 1910, #105. What ray divine streams from afar! God's glory there is shining. Which after truth is pining! Dry our tears, and end our dying. Thee, my portion, to inherit. In Christ, our Lord, appearing. Why still my soul be fearing? 'Gainst all foes who may offend thee. 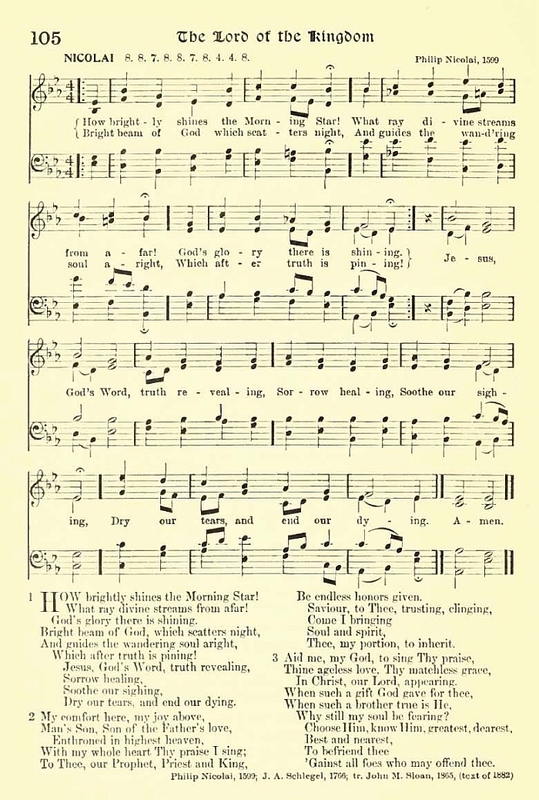 Additional verses according to Charles Seymore Robinson, Annotations Upon Popular Hymns (New York: Hunt & Eaton, 1893). Throughout heaven's great for ever. Till the world with praise rejoices. Evermore by earth and heaven! Rev. John Morrison Sloan, M. A., son of a Scotch farmer, was born in Ayrshire, May 19, 1835, and studied at the universities of Glasgow, Edinburgh, and Erlangen, Germany, graduating at Edinburgh in 1859. Five years later he became collegiate minister of the Free Church in Dalkeith, and afterward was settled over Free Churches in Aberdeen and Glasgow; he is at present a pastor in Edinburgh. He has made several translations from the German, the most widely known being the one given above. This was published in Wilson's Service of Praise, 1865. It is a version of the German hymn beginning, "Wie herrlich strahlt der Morgenstern." The original was first given to the public in 1766, and was entitled, "Longing After Union with Jesus, on the Model of the old hymn, ' Wie schon leuhtet der Morgenstern.'" This last is the well-known composition of Philipp Nicolai. Sheet Music "Nicolai" by Philip Nicolai, 1599, from Henry Sloane Coffin and Ambrose White Vernon, eds., Hymns of the Kingdom of God. New York: The A. S. Barnes Company, 1910, #105.